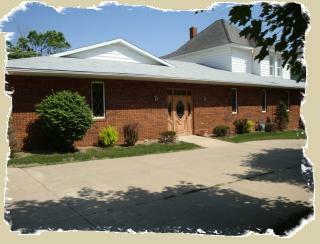 Geilenfeld Funeral Home celebrated 110 years in Oelwein in October of 2011. Henry and Albert Hintz started the Hintz Funeral Home and Furniture Store in the Hanson block of West Charles in 1901, coming from Albert Lea, MN to purchase a furniture and undertaking business. In 1917, they constructed a new building on South Frederick, across from the Mealy Hotel. In 1939 they purchased the parsonage of Christ's Church on First Ave NE, where the funeral home is located today. In 1950, the businesses separated from the furniture store owned and operated by Henry's son Harold Hintz moving to a new location. The funeral business was purchased and operated by Henry's son, Carlyle Hintz and his son, Richard. A new chapel was constructed on the site and the home remodeled. Chuck Geilenfeld came from Algona to join Richard Hintz in 1975 and in 1986, the name was changed to Hintz-Geilenfeld Funeral Home. Geilenfeld is a second generation funeral director, following in the footsteps of his father. The funeral home became Geilenfeld Funeral Home in 1988. In 1991, a new addition was built with a large chapel seating over 200 people. A children's room is featured for visitations. In 2009, the funeral home added it's featured banquet hall. In 2010, Oelwein native Eric Buehner joined the funeral home, returning home from Marshalltown where he was a Funeral Director at Mitchell Family Funeral Home. There have been many changes over the years in the funeral business, however Chuck and Eric strive to emphasize the reverence, dignity and spiritual inspiration in relation to a person's death.